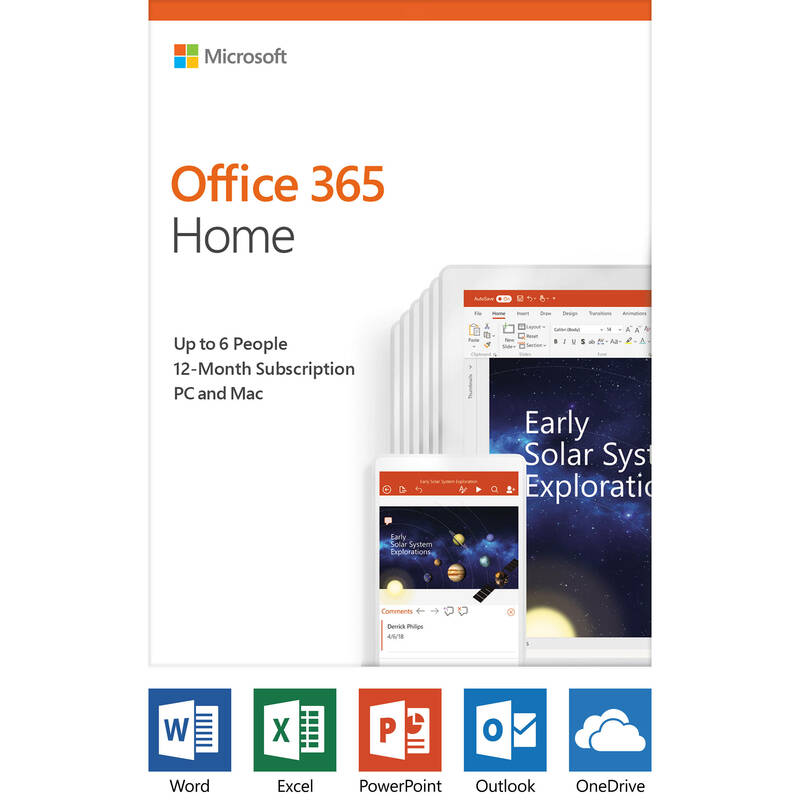 This license card of Office 365 Home from Microsoft is a one-year subscription to Microsoft Word, Excel, PowerPoint, Outlook, OneNote, Publisher, and Access. This subscription includes six user licenses, which may be used on a Windows PC, Mac, tablet, and Android or iOS devices. Also included with this subscription is 1TB of OneDrive cloud storage per user and 60 Skype minutes of calling per user to mobile phones and landlines, which resets every month. You can share Office 365 Home with up to six people. With Office 365, you have the ability to store your documents and files in the cloud with up to 1TB of OneDrive storage space per user. Once your files are stored, simply sign into to your Office account to access your files from virtually any Internet connected computer, as well as other select devices. Please be aware that Publisher and Access are only available for Windows PCs and are not compatible with Mac. Internet access is required to install and activate all releases of Office using the product key. Office 365 also requires Internet access to manage your subscription account, for example to install Office on other computers or to change billing options. Additionally, Internet access is required to access documents stored on OneDrive, unless you install the OneDrive desktop app. Customers with an active Office 365 subscription will be entitled to the newest versions when available. 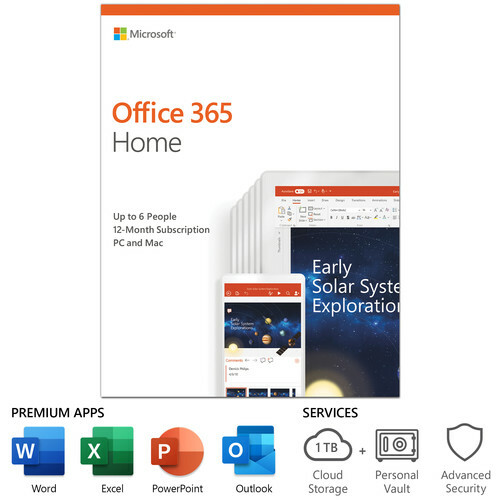 Box Dimensions (LxWxH) 5.85 x 4.55 x 0.85"
Office 365 Home (6-User License / 1-Year Subscription / Product Key Card) is rated 3.5 out of 5 by 2. Rated 3 out of 5 by Stephen from Dont like paying every year. I finally upgraded from Office 2008. It doesnt seem like a huge difference from the earlier version, but I thought upgrading every 10 years or so is about right. I dont know if Ill stick with the subscription at $99/yr. Rated 4 out of 5 by Kathleen from Convenient but no app for Publisher I like the programs so far. I have been a desktop Microsoft user for eons. I did not realize there was no app available to use Publisher on my iPad. That is definitely disappointing. Other than that, so far so good.